How do I create continuous pitch shift? I want the effect of a vinyl that is not moving in the beginning and then continuously accelerates to normal speed. 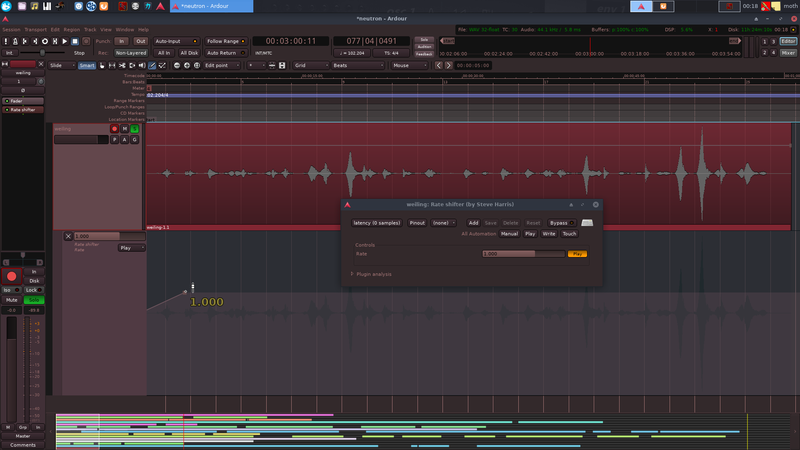 Can this somehow be done in Ardour? How is it normally called? You can use Steve Harris Rate Shifter from swh-plugins. Simply draw a slope from 0 to 1 in the automation lane for ‘Rate’. Adjust slope length for desired acceleration. Short answer is that Ardour probably isn’t the best tool to do this, sadly. I would suggest a different tool, probably a destructive editor, and then importing the product with that effect on it into Ardour. What tool is best for this depends on your particular circumstances. I’ve tried with Audacity as well but it only supports the magic thing, not the easy pitch-and-speed-at-the-same-time-sweep I want. Good Lawd this plugin suite is just awesome. Thank you! Now I got it working, pretty nice! Wasn’t aware of it, good to know, will have to look into it. There’s also the bitrot plugins. Contribute to grejppi/bitrot development by creating an account on GitHub. Has a similar effect in it. Bitrot is great. It has only tape stop though, no tape start. Or maybe “tape stop” can be somehow combined with “reverser” to make some sort of tape start effect? I think bitrot can do stop/start in the same plugin. Not sure tho.